Mining Monero in 2018 makes perfect sense as it is easier to mine, and allows beginners to begin mining with comparatively low budget. We have already discussed how to mine monero in our detailed guide for beginners, as well as the best GPU for mining monero in another previous post, but in this article, we will discuss the next most important hardware in your mining rig, the 6 GPU motherboard. The motherboard is one of the most important hardware in your mining rig, as you attach everything to a motherboard in the rig. A wrong decision may not only reduce the life of your mining rig, but can also affect the performance of your Monero mining rig. Even though you now have option to build 6, 9, and even 13 GPU mining rigs, but as we discussed in our Monero mining tutorial in our previous post, 6 GPU is the most common type of rig used for monero mining. This is because it is low cost and provides you good return for your investment, but only if you have the right hardware. So, let’s move to the actual topic of this article, what is the best 6 GPU motherboard for mining Monero? Well, we recommend ASRock H81 PRO BTC R2.0 LGA 1150. Here is the detailed review and reasons why we believe it is the best 6 GPU motherboard for Monero mining rigs. First, the manufacturer, ASRock is one of the leading and most recognized brand for high-end motherboards. It is a Taiwan based company that manufactures motherboards for home theatre PCs, industrial PCs, and recently for mining rigs. It is currently the third largest manufacturer of motherboards. So, when you are buying from this brand, you are buying a sturdy and quality motherboard. The best thing about this brand is, it offers the same performance as market leaders like GigaByte but at lower price. Now, let’s look into this particular model. The H81 PRO BTC R2.0 LGA 1150 allows all 6 GPUs to fit in very easily. It features 1 x PCI-Express 2.0 x16 Slot and 5x PCI-Express 2.0 x 1 Slots. Another best feature why we recommend this one over GigaByte motherboards is low price. If you are looking for the best value for your money, this is what you buy. It can support almost all popular GPUs, as well as CPUs. The drivers are easily available and it can works really well with Windows operating system. This motherboard is specifically designed for mining, which means it doesn’t overheat. If you are using PCIe risers with this one, it is even better to avoid overheating. It supports DDR3 RAM, ATX motherboard, and CPU socket LGA 1150. Even though there are more high-end brands available, but for monero mining, you can save some money by using a low-cost but equally efficient ASRock H81 PRO BTC R2.0 LGA 1150. 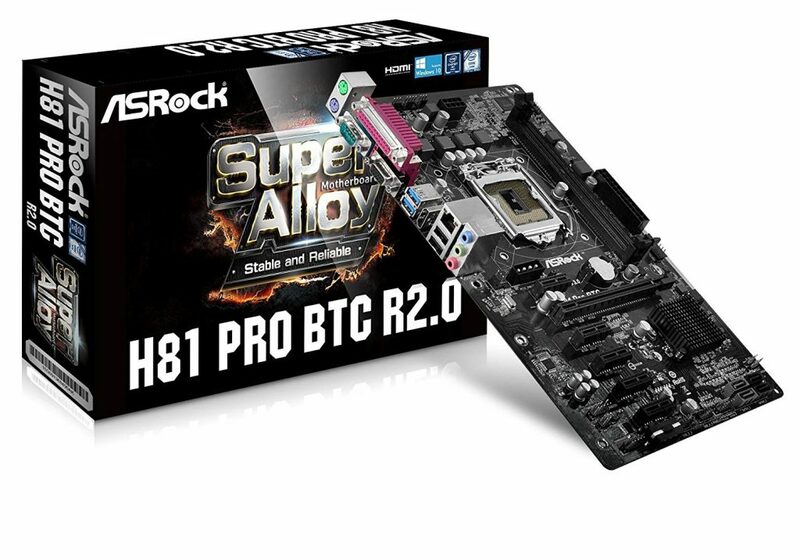 ASRock recently launched another of their mining motherboard for 13 GPU, ASRock H110 Pro BTC. This model was a huge success, in case you want to move to the 13 GPU mining rig. Next articleWhat is the Best Energy Meter for Crypto Mining?